Book a headshot photographer with a track record of getting actors auditions in as fast as a week! With over 70 amazing online reviews from happy actors, it's clear to see my headshots are getting actors auditions - some as quickly as within 24 hours of updating their headshots! 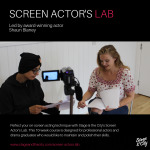 Over the years I've worked with actors including Julie Walters, Samuel L. Jackson, Eddie Redmayne and Margot Robbie on set of some of the biggest movies and I bring this unique insight on to my headshot sessions to give you a professional service with results you'll love. Check out https://www.aimeespinks.com/headshots/ for more information or get in touch with any questions! Birmingham based, modern headshots from an internationally published and exhibited photographer.